Chelsea Loves TV – Page 12 – Let's talk television! 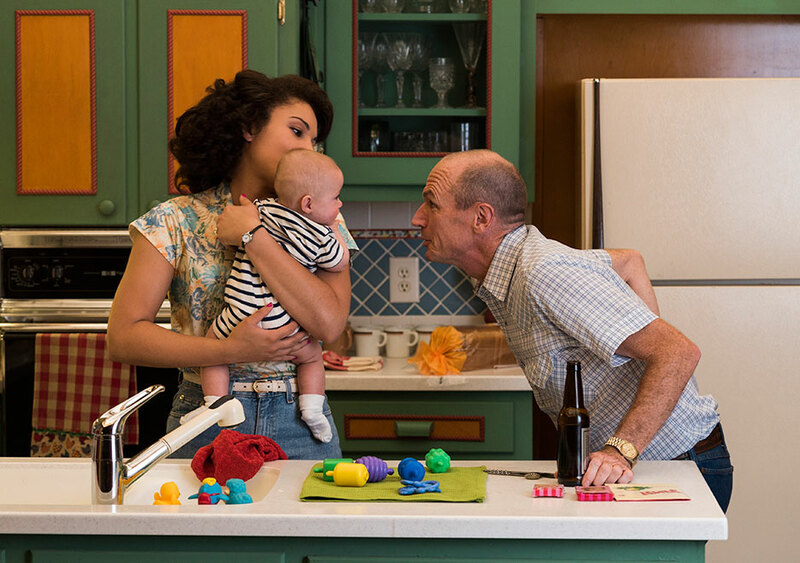 Tonight’s Halt and Catch Fire episode, “And She Was” catered to everything fans love about the show. We had so much happen in this episode and yet it never seems rushed or forced. This season so far has really been about four main things: Donna and Cameron’s relationship, Gordon’s health, Joe MacMillan’s “Next Big Thing”, and Bosworth’s place in all of this. Tonight’s episode covered all of those and all the places they intersect so beautifully, and on top of that, we had some of the best cinematography so far this season. First and foremost, Donna and Cameron’s strained relationship is taking its tole. With secrets all around, lies being told, and both of our leading ladies struggling to balance their working relationship with their friendship, the fireworks were bound to come, and they came in the form of Cameron making a unilateral decision without Donna, only for Donna to have to face her own lies when she confronted Cameron about it. We can see both Donna and Cameron breaking down at this point in the season. With Cameron freaking out about losing parts of her soul with Mutiny and the potential of an IPO, and Donna feeling constantly like she’s playing second fiddle to the Great Cameron Howe, it was good to see the way that Donna, at least, still wants to work things out with Cameron. There’s little that’s more refreshing than the way this show gives us such a complex, complicated, real relationship between women. It’s a feminists fantasy brought to life. Directly related to Cameron’s state of mind is the fact that, in tonight’s episode, she finally learns about Gordon’s neurological problems. So far this season, we’ve seen Cameron and Gordon kind of going at each other like quarreling siblings, because they act like they don’t like each other, and yet they seem to be the most compatible people on the show. They have a pretty solid friendship going this season, and nothing was funnier than watching them take over the girls’ Nintendo and spend all weekend trying to beat the game. It was also very telling to see how Cameron’s reaction to finding out how sick Gordon is was to go to Joe and demand he give Gordon credit for what he had done. She and Joe have such a history, but I really do believe that it was out of her loyalty to Gordon, in spite of their past, that she did so. It’s always so electric to see Cameron and Joe on screen together, because it’s always so obvious that each of them is basically addicted to each other’s draw, but they’re so toxic to each other, and you want them both to just get away from the other before they ruin each others’ lives again, but at the same time, the chemistry that Lee Pace and Mackenzie Davis have on screen together is so intoxicating, isn’t it?! While we talk about chemistry, it’s worth mentioning that I’m not really that into the whole Bos and Ms. Investor Lady weirdness. I don’t know if it’s the actors lacking chemistry or if it’s supposed to feel just a little off because of how conflicted Bos is about his place in this world right now, but it’s just so awkward and weird when they’re together. Bos’s clear disconnect with the California life makes me think that he’s probably gonna go back to Texas at the end of this season. I’ll sure hate to see him go, too. One thing that isn’t one of those main points that I just feel the need to touch on is how beautifully this episode was shot. Anybody who has ever watched this show is no stranger to very beautiful cinematography. This show deserves all the cinematography awards there are and I still call BS on the fact they haven’t won an Emmy for that, but tonight was especially beautifully shot. There were a few scenes that I just feel the utter need to highlight. It’s more beautiful in motion, but the composition of this shot, the lighting, the camera pan from right to left, it’s just so beautiful. Again, more beautiful in motion, but the camera showing Joe’s face through the glass shelf with the reflection of him unwrapping the champagne bottle is such a nice, intimate angle. Halt and Catch Fire‘s norm may be the utilization of negative space, much like this shot, but to have the subject so far from the things nearest the camera as well as positioned slightly further than the rule of thirds suggests is one of my favorite things this show does so well in an artistic sense. The resulting ‘pointing out’ of the subject is just very interesting and I love it. There are dozens of shots from tonight’s episode I could do this with, but those three are ones that really stood out to me tonight. This shows artistry is just so impressive. As I said, the one main thing we haven’t covered that this episode gave us a GREAT taste of is Joe MacMillan and how he’s working towards his “Next Big Thing”. This episode, we got to see Joe and Ryan working together and finally seeming to really be friendly, which I guess answers Ryan’s “Do you even like me? !” from last episode (I’m still pretty sure Joe and Ryan are gonna bone, so there’s also that). They’re going behind the board’s back on this new, big risk for the future that Joe and Ryan have cooked up together, and we get to see some great character development with Ryan as well as a big shocker at the end that I won’t spoil, just in case you haven’t seen, but needless to say, I have a feeling Joe MacMillan is back. The real Joe we all know and love in his complexity. If there’s one eternal truth about Halt and Catch Fire, it’s that nobody can outmaneuver Joe MacMillan. So I’ve been binge watching Prison Break…. Oh my God like WHY DID NOBODY TELL ME THIS SHOW WAS SO DAMN GOOD?! I’ve only heard of it at all before because I watch the CW Berlanti ‘verse and Wentworth Miller and Dominic Purcell are both semi-villains on two of the shows there, and I kept seeing mentions of how they were both well known for Prison Break, which apparently aired while I was in high school. I don’t know anybody that watched this show, I didn’t watch TV back then, and I don’t know anybody that has binge-watched it since it aired, so I honestly heard NOTHING about this show until I saw the hype about it getting a season 5 next year, and saw the re-runs coming on Audience around the time Kingdom was on (one of my favorite TV shows ever). It was on my ‘because you watched *insert show here*’ suggestion on Netflix after I finished binge watching Ripper Street two weeks ago, and basically, for the past 12 days, every night I watch at least an episode of Prison Break. AND I AM ANGRY AND UPSET THAT NOBODY EVER TOLD ME TO WATCH THIS SHOW BEFORE NOW! WHY DO YOU ALL HATE ME?! Anyways, I’m going to wait until I finish the entire 4 seasons before I actually talk about it and give a review. I just wanted to let you guys know that it’s probably going to be incredibly long or possibly in ‘one post per season’ style, because this show is amazing and I love it and I’m angry at you guys for not telling me to watch it before now. Author J. Chelsea WillifordPosted on September 18, 2016 September 18, 2016 Categories UncategorizedTags FOX, Prison BreakLeave a comment on So I’ve been binge watching Prison Break…. This week’s episode of Halt and Catch Fire, “Yerba Buena”, starts on Fourth of July weekend and the fireworks are both literal and figurative. With the tensions at Mutiny over whether or not to include a credit card function for people to buy stuff through Swap Meet, Donna and Cameron’s last day at work before the weekend starts out with an argument first an foremost. It really set the scene for what was coming up in the episode, I would say. The way Donna and Cameron are at odds with each other sets the tone for the entire episode and highlights the brewing storm on the horizon between them. Cameron and Bos’s trip to Texas for Cameron to get her stuff coincides with Gordon and Donna’s long weekend together, and we get to see the oddity, once again, of Gordon somehow being the least fractured character on the show. We’re so used to Gordon being the one that’s losing it, and whose life is falling apart, and this season his illness isn’t downplayed, but rather it’s falling into the background while all the tension everyone else has roils beneath the surface and prepares to blow up in all of their faces. While in Texas, Bos visits his new grandson and Cameron plans to visit with her ex, and Mutiny’s ex-programmer, Tom Rendon. I loved the way that at first, it seems like everything is fine, right up until it’s not. Without spoilers, I will say the way that things just twisted for Bos and for Cameron made their sudden blow-out all the more perfect. Also, from an artistic standpoint, that scene with Cameron on the roof was absolutely beautifully shot. And of course, while all of this is going on over at Camp Mutiny, Joe and Ryan (who I’m still convinced are going to bone) are working on trying to find the next big money-maker to fill the hole that Joe has dug into his company. Of course, Ryan is a work-a-holic, but Joe’s tensions bubbling beneath the surface are revealed to be a much bigger problem than what they’ve faced so far. I have to be honest, I knew going into this show that eventually, the AIDs crisis would come into play, but I sort of hoped that the mention of it last week wasn’t the foreshadowing that we’ve come to. This episode, Joe faces the potentiality that he may have HIV, and though we don’t get a clear reveal as to whether he does or not, I really hope he doesn’t, and I’ll tell you why! As a Queer person, I can assure you, when it comes to gay and bisexual men, even without the perfect time-setting this one has, it is ALWAYS about A, S, or M in the end. AIDS, Suicide, Murder. Think of any queer male character in any movie or TV show. Now mentally weed out the ones who don’t have HIV/AIDS, don’t kill themselves or attempt to do so, and aren’t murdered or survive an attempt on their life due to a gaybashing. While it would be remiss of the writers of Halt and Catch Fire to ignore the 80s AIDS Crisis when they have a bisexual male lead character and this season is set in San Francisco, it is too expected of them to give Joe AIDS. This show never has sloppy writing that goes with what’s expected of them. This show is known for keeping us on our toes and making things unexpected in various ways, and to go with the “Oh, our queer guy has HIV!” plot line would just be lazy writing. The episode ended with the tensions over at Mutiny coming to the surface, and we got to see the fall-out from Cameron not being around and Donna having to make decisions without her. The proverbial fireworks were derailed, however, with one of the most touching moments that I would have never expected of Cameron there, the moment where she told Donna her honest truth: Donna makes her better and she always has her back. It was moving and I absolutely love to see such a complex relationship between women on television, especially on a show set in the past like this one. It’s something I have wanted to see from these two for quite a long time. They avoided catastrophe at Mutiny with a new decision that they both agreed on, that Cameron worked on with Tom during the week she was missing. But, as always, when things finally seem to be going right for Cameron, she learned a shocking truth at the end of the episode, and left us with an EVEN MORE SHOCKING twist of events! Whose ring was that?! Is it hers?! Did she and Tom get hitched?! What will happen when she finally confronts Donna about her betrayal?! Halt and Catch… up with Gordon’s Controversial Military Tactics! 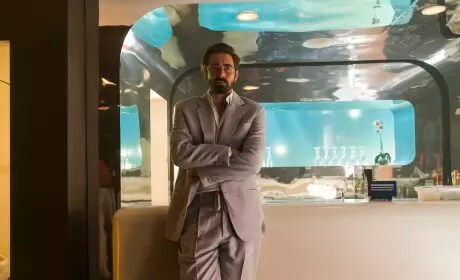 Last week, I sort of did an overall ‘the road so far’ type post, but tonight’s episode of AMC’s Halt and Catch Fire gets my full attention! After last week’s acquisition of Swap Meet, this week, the tensions were high over at the Mutiny headquarters because of the controversial clash of coders as Craig and Doug face off with Cameron over the way the combined system should be coded. With the whole Mutiny team facing off with the Swap Meet team over the use of C++, the tensions inside of Mutiny have almost nothing compared to the tensions outside the coding room. This entire episode was a very weird one both thematically and artistically. We have a very noticeable disconnect between Donna and Cameron that’s on par with every other major character in their respective ways. Even Craig and Doug aren’t on the same page, what with Craig hinting at getting rid of Doug. Bos’s usual charm is hiding a strange disconnect with everybody else. Something is brewing in that head of his and he’s keeping his cards close to the chest on this one. Diane has an obvious attraction to Bos, which gives us this very seemingly-random glimpse into her own personal discord at the moment in her life, and it gives a strange focus on building her as a character. As for focusing on a person’s character in an extremely odd way, we had this, once again, seemingly out-of-nowhere and not-plot-related call to focus on Cameron and her history. Most of us barely remember that in season 1 (I think?) Cameron came clean to Bos about how Cameron Howe was her father, and her real name is Catherine. This episode, we get a call from her stepfather about whether or not she wants some of her father’s things before he and her mother sell them. We also have a hint that the relationship between Cameron and her mother isn’t a good one, if there is one at all. Another thing that I noticed being very uncharacteristic was the camera work for this episode. This show’s cinematography is one thing that has always stood out to me, and one of those things that I think makes this show have some very dynamic shots is how often this show makes use of hand-held camerawork. The show seems very organic and natural with its camera work, which makes it all very natural-feeling. However, this episode there were multiple points where the shots were very odd. For lack of better technical knowledge, it was almost like jib-shots? It happened a few times, but the one that really stands out is in the scene where Joe and Ryan are working with the whiteboard. It was very obvious and very distracting. I can’t recall much of that sort of shot being used, and the goal of camera work is for the shots to not really stand out, but I definitely wasn’t a fan of the very sweeping, fluid camera movements this episode. I don’t know if they have been used before and just blended better, but it really stood out. HOWEVER, it is entirely possibly that was supposed to happen. Much like the strange focus on character moments that didn’t seem to fit the plot, this could’ve been a way to help make the discord more obvious? I’m not sure, but whatever it was, I’m still on the fence about whether I liked that or not. Speaking of discord and very odd scenes that seemed out of place but was most likely entirely on purpose, can we talk about the party scene? Between Bos being very odd behaving, and Diane’s random character moment, and Joe’s entire point in that scene, that was a very interesting and oddly well done scene. I liked the clear dichotomy between Bos for the People, and Bos expressing himself more honestly. Also, I really loved the way that we’re reminded very blatantly of Joe’s sexuality. We see him there with a handsome man as his date, and he then has a little flirtation with Diane, which leads to his conversation with Ken (Mathew Lillard) quite perfectly. Using a scene that emphasizes his sexuality and then following through with that little story line later into a scene where a man makes homophobic remarks was a genius way of making sure nobody somehow magically forgot that Joe is bisexual. Also, how can you ever get tired of a TV bisexual being shown to flirt with men and women all in one scene? It isn’t something you see often, and trust me, we bisexuals really appreciate one so apologetically, in-your-face bisexual as Joe MacMillan. It’s a bold move for what you would expect of a show set in the 1980s, and it’s never a let-down. And of course, no recap of the episode can go without touching on Gordon being the one person on the show that has already been somewhat isolated from others and is finally reaching out and connecting with others. In an episode full of discord, it’s really interesting to see that Gordon’s issues are all internal. His health problems are clearly acting up all episode, and yet he’s the one reaching out instead of isolating out of all the main characters. The scene at the end with him and Cameron bonding over Duck Hunt was actually really nice to see. They have this very interesting relationship where they get at each other’s throats but still seem to get each other quite well. It’s almost like one of those ‘siblings who pretend to hate each other’ dynamics and it’s nice to see that, out of everyone, Cameron speaks up about her problems to Gordon. Besides, who can dislike the “dich un dolph” moment? But most of all, you can’t help but love, as the title says, Gordon’s laser tag “controversial military tactics”. 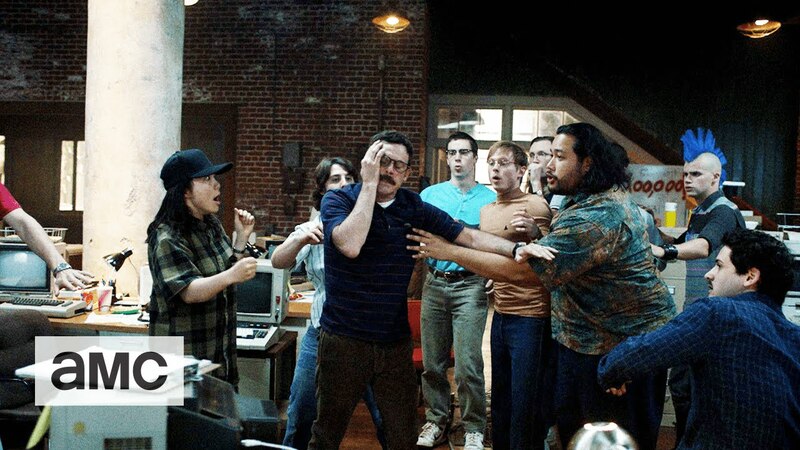 That entire scene with Gordon and the Coder Monkeys bonding at an arcade was definitely a great counterpoint to the very serious problems everyone else is dealing with. Next week’s preview looks like a bad day at the office for Cameron, so be sure to tune in next week to see what’s going to happen there! Author J. Chelsea WillifordPosted on September 7, 2016 September 7, 2016 Categories Episode ReviewTags AMC, Halt and Catch FireLeave a comment on Halt and Catch… up with Gordon’s Controversial Military Tactics! 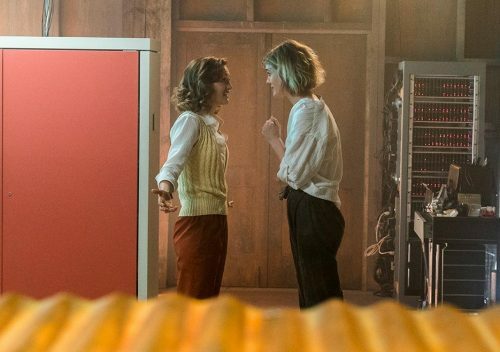 Last night the third episode of season 3 of AMC’s 80’s tech drama Halt and Catch Fire aired, following last weeks’ 2-episode premiere night, and three episodes in and the show is already giving you a good look into the journeys to be undertaken this season. 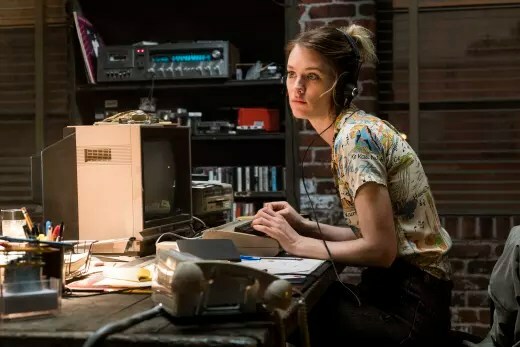 If you are familiar with the story and characters of Halt and Catch Fire you’re probably one ofthe few (no seriously, FEW) who watch this show. AMC, the network known most commonly for The Walking Dead and Breaking Bad, has never really advertised this show well. Even in their ads that show a montage of all of their other shows, Halt and Catch Fire is rarely included. In fact, this season is the first time I’ve seen commercials advertising it since its premier in 2014. Without giving a full recap of the series, I’ll just set up the season for you and say that the characters have come a long way from their humble season 1 beginnings in Texas’s Silicon Prairie. Donna and Cameron getting shot down once again by a potential investor. At the start of season 3, Donna and Cameron and the Mutiny gang have gotten the ball rolling with their expanded work on Community with their (not so) shiny new mainframe in San Francisco. 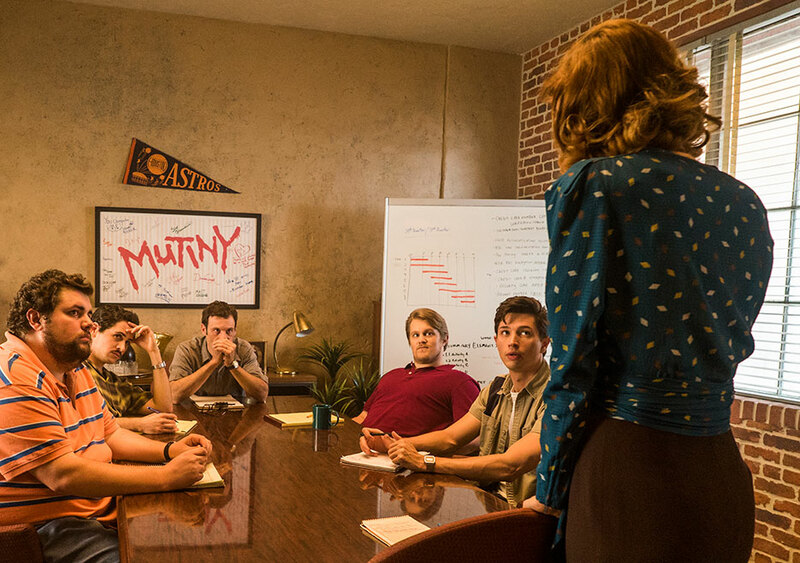 While looking for investors to expand and start a new branch of what Mutiny does, Donna and Cameron face their same old problems with sexism in the tech industry in the 1980s. With Gordon and Donna’s marriage still on the mend after his psychosis-related tumble with another woman, their daughter getting into fights at school, and sharing their house with Cameron ‘temporarily’, not to mention the coders being their usual selves, the folks at Mutiny have some real work to do. About the only positive note is that all the original coders from the Cardiff crew that went to join Cameron at Mutiny are back together again and working as well as ever. This season’s new guy, Ryan Ray, started out as a coder at Mutiny but, within two episodes, he defected to work with Joe MacMillan. Ah yes, finally we see what Joe has been up to lately. After stealing Gordon’s idea for what is, effectively, anti-virus software, Joe has run with it and has built an entire company. After finding their competitors for their new product, Donna and Cameron bring the idea to investors to buy the competition rather than invest in their company to try and overtake in the market, and the ball gets rolling to bring forth their newest branch of Mutiny, Swap Meet. Okay, that was your crash-course in ‘the world so far’ for Season 3, so now I can actually talk about last night’s episode! After being hired by Joe, Ryan finds himself at one of Joe’s parties, and we get a look at the expected life of Joe MacMillan in San Francisco, but as soon as Ryan finds Joe out on the balcony, we’re all reminded that this Joe may not be the same Joe we’ve gotten used to. Joe MacMillan is by far one of the most interesting characters on TV today. Joe’s enigmatic desire to connect with people and be their friends clashes with his absolute inability to not screw people over. This time, instead of Gordon or maybe Cameron falling into his trap, it seems to be Ryan. Ryan, who is so out of place in this Joe MacMillan world, is probably, I suspect, going to end up being the person that Joe clings to this season. Clearly, Joe himself is out of place in the Joe MacMillan world. A point that really brings attention to this fact is the way that Joe keeps bringing Ryan into things. In this episode, Joe brought Ryan in to a board meeting about when to start charging for the product Joe promised to be free to the individual users, seemingly just to test him (also, hi Mathew Lillard the Board Dude. Wow, you haven’t aged much at all!) and, later that night, Ryan found it in himself to actually confront Joe about the entire situation and express that he thought the product should remain free, Joe seemed to finally see the spark in Ryan that convinced him to hire him in the first place. Another huge surprise this episode was finding out that, after years of selling tech products, Joe is learning how to code himself! When he goes to the college he has been secretly attending, he runs into Cameron and it was nice to see that, for once, Cameron didn’t seem that bothered. If anything, he seemed to be the one to come out of the conversation the most rattled. Their relationship is so oddly toxic but you can’t help eat up every moment both of them are on the screen together. I have to say, I’m excited to see how Joe lets his own Joe MacMillan-ness get in the way of his own success this season. I can only assume this season, after he has asked Ryan to start working on a secret project with him at his house, Ryan is his new Gordon (granted, I’m still convinced Joe and Ryan are going to end up sleeping together, so maybe ‘his new Cameron’ is more accurate?) and I can’t wait to see how Joe will build up the dependency and then self-sabotage any friendship/relationship they build. At least this season, Gordon knows better than to get involved with Joe again after being burned twice. I don’t know about you guys, but I cannot WAIT to see where the show goes from here. This season could very well be its last (which I say to myself after every season but it was renewed twice), so I’m going to cherish every moment I get to see Donna, Cameron, Gordon, and Joe on my screen. Welcome to Chelsea Loves TV! Some of you may know me, some may not, but my name is Chelsea and this is my TV talk blog! The reason some of you may know me, to those who don’t, is because I am the person behind Chelsea Loves Movies, the movie review blog/hashtag/tumblr tag. If you follow me on twitter or at the blog, I do #FilmReviewFriday (though granted, not always on time) where I review a movie every Friday (mostly). On top of my love of movies, I absolutely adore television. I’ve toyed for about a year now with the idea of a Chelsea Loves TV blog and I decided that, starting with this fall’s television line-up coming up, I would start doing so finally. We’re going to start with a post tonight as like a test-run to see how you guys like it, where I talk about last nights Halt and Catch Fire (the season is a summer show, but it premiered last week, so I’m going to make it my first show to go along with) and tonight’s The Night Shift finale. I’m not sure I like my planned format just yet, but Halt and Catch Fire will give me time to get some feedback from you guys and that way, when the fall shows start, we’ll be golden! Hopefully we can have as much fun here as we do over at Chelsea Loves Movies! Author J. Chelsea WillifordPosted on August 31, 2016 Categories UncategorizedLeave a comment on Welcome to Chelsea Loves TV! Stay tuned for more updates as I learn more about new shows starting that I’ll want to watch. Chelsea Loves TV Blog at WordPress.com.